Neutral players who operate in wide channels, 1 ball. • D’s in mid-third attempt to cover 2-3 of the 4 zones. • All attacks must pass through middle third. be taken, due to structured nature of practice. - Marking positions & distances. - Passing opponents on to other MF defenders. 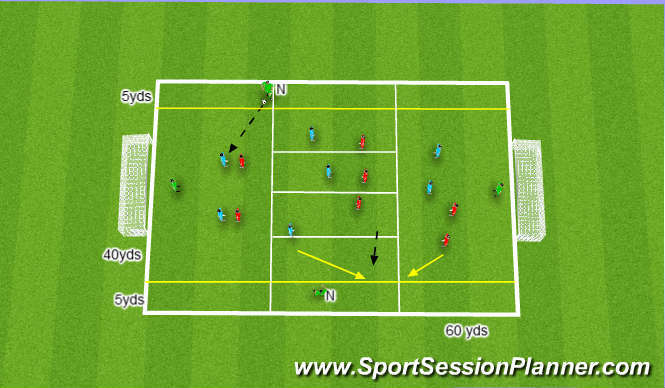 - Moving across pitch together as a 3 man unit. - Tracking opponents as they move forward. - Man-for-man marking used in each end zone. third to take up scoring positions. - Defensive compactness & shape in each of the thirds. - Defensive pressure, cover & balance. • Angles & distances of support to the pressurising D.
• Positioning & looking to intercept. • Keeping sight of ball when in marking & covering situations. • Tackling off front & back foot. • Preventing attackers from turning. • Blocking passes crosses & shots.